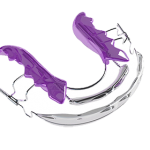 At our dental clinic in London, we offer the Inman Aligner, a customised, removable orthodontic brace designed to quickly, gently and safely correct the positioning of misaligned teeth in a matter of weeks. Using one to straighten your teeth will improve their aesthetics, health and longevity. It’s among the most effective and innovative orthodontic treatments available, and offers a shorter treatment time and a lower cost than alternative types of braces. It can take as little as 6 to 16 weeks to straighten your teeth with this brace. This compares to 6 months to 2 years for some other braces. An Inman Aligner is suitable for use for both children and adults who suffer from mild to moderate misalignment of their upper and/or lower front teeth. For severe teeth misalignment, or where teeth other than the front ones are affected, an alternative type of brace is normally advisable, which our orthodontist at our clinic on the Kings Road in Chelsea will discuss with you. To maximise comfort and results, an Inman Aligner is custom made to fit your precise specifications. This is done by using x-rays, photographs and impression moulds. This process is conducted in-house at our dental clinic and the timeframe from the day of your consultation to the initial fitting of the brace is typically less than 2 weeks. The brace works by applying gentle but continuous pressure to the teeth that need straightening via a spring coil bar at the rear of your teeth and a bar across the front of your teeth. These two components create a push and pull effect, with your teeth gradually being guided into their new position. You can easily remove and replace the Inman Aligner as desired, so for a special event, or for a photo being taken, or any situation where you would temporarily rather not be wearing it, you don’t need to. The bar that sits in front of your teeth means that an Inman Aligner is not as ‘invisible’ as, for example, an Invisalign brace, however, it is much less visible and visually intrusive than typical fixed metal braces. You should wear the Inman Aligner for 16-18 hours a day. The more you wear it each day, the more time it has that day to have an effect, and the quicker the end result will come. Therefore, only wearing it when you’re at home, or during the night, is counter-productive. For the first few days you wear the Inman Aligner, some soreness or tenderness in your mouth may be felt, and you may salivate more than usual and find speaking feels awkward. These are all short-term, temporary issues that will not continue for the duration of the treatment. You will need to visit the orthodontist at our dental practice every 2-3 weeks during the course of treatment for the movement of your teeth to be monitored and for adjustments, like the tightening of the appliance, to be made. To find out more about the Inman Aligner, or to book an appointment at our dental clinic in London, call 020 7148 7148, email info@thewellingtonclinic.com or send us a message using the below contact form.